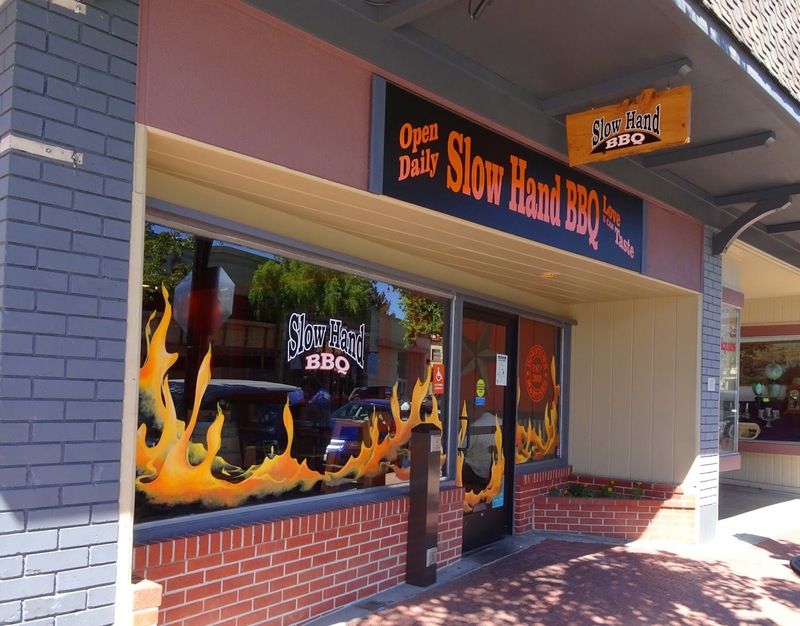 Slow Hand BBQ has opened a second location in Martinez California. Martinez is in our backyard and we were excited to sample this new bbq restaurant. The location has housed numerous bbq joints over the years. Downtown Martinez can be challenging for a restaurant because after the court house closes the town shuts down. A small disclaimer will be added today. We are returning from a weekend of championship barbeque and we have nothing but high hopes for this restaurant. We are entering Slow Hand BBQ with an open mind and hungry palette. The interior has not really changed from the previous owner. The wall decorations are a little different. There is a huge wall menu and you place your order at the counter. We learned fast from our order taker there are no deviations from this posted menu. I like to get a sampler or at least several different meats to get a feel for the place. Well our order taker would not do that. There is no such thing as a sampler or 2 meat dinner. He did point out we could order the one meat platter and buy other meats by the pound. Fair enough. I ordered the brisket dinner with two ribs. Nope, I was corrected. I could only order four ribs. I did as instructed and this lesson was learned. 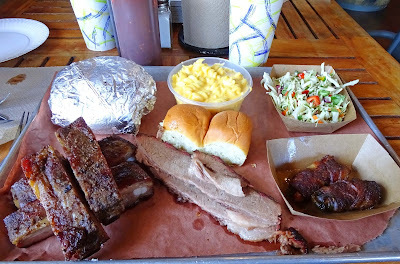 Ribs, brisket and side of slaw for me and tri-tip sandwich with mac&cheese for Ms. Goofy. We also started out with two bacon wrapped cheese stuffed jalapenos. Our meal was delivered promptly on a paper lined cafeteria tray. We started with our bacon wrapped jalapenos. They were tasty and rich. They also had a texture as they had been sitting in a hot box for a very long time; limp. Ms. Goofy’s trip tip sandwich was a very generous proportion of grey looking meat. The grey appearance was deceiving because it was tender and had good beef flavor. Ms. Goofy really enjoyed her thick and creamy side of Mac & Cheese. The ribs and brisket were cooked properly. They both were tender and had good smoke. The problem with my ribs was the dry rub was very pedestrian. A good bbq rub is supposed to enhance and compliment the meat. This rub was very forgetful. 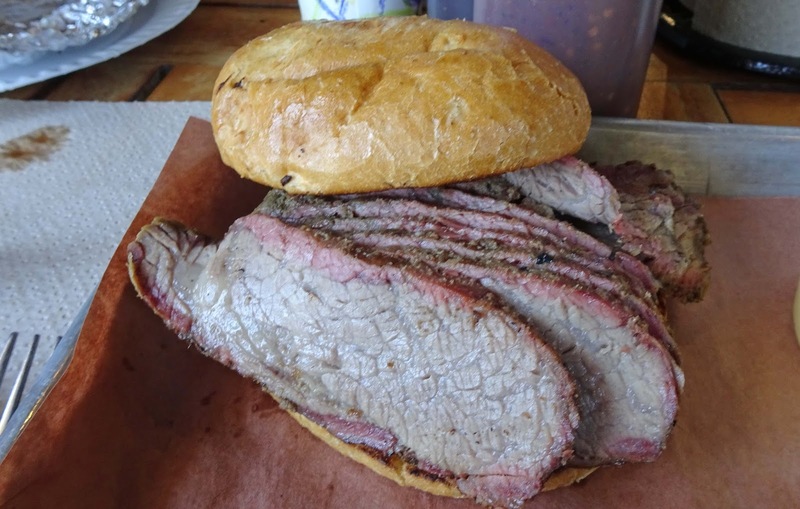 The brisket was on the dry side. There were two tomato based house made sauces to revive these bland meat offerings. The very thin fluid sauces were a disappointment and could have been labeled bland and blander. This platter was served with two stale parker house type rolls that was not consumed. There was a highlight to my meal and that was the Cole-Slaw. It was not a traditional mayonnaise based but was alive and vibrant with the perfect vinegar seasoning. Shredded cabbage with sweet peppers really refreshed from my mediocre meat offerings. We want to love Slow Hand BBQ because it is so close to our abode. There were hits and misses today that makes it hard to give it a thumbs up. We have not given up on this restaurant. We are going to return on a Sunday when they serves giant beef ribs and will be sure to not deviate from the posted menu.. The verdict is open till after our return. Sounds like this on won't last either. As a comp. judge eating the very good stuff, I imagine it is very difficult for you to find restaurant que you consider really good. Big Dude, We go to bbq restaurants with the expectations of having a good meal. It does not have to be award winning to be enjoyed. Side dishes, ambiance, service and the most important did we enjoy the meal are all taken into consideration. Maybe sometimes we are to critical about the bbq meat but it is what we do. I'm not a certified KCBS BBQ judge today. However, I once was. I took the class and judged more than a few competitions. A large portion of that training is to judge BBQ on its own merit, not based upon our likes and dislikes. Nor are we allowed to compare and contrast with previous entries. From the small amount of judging I did do, I can say with authority, not all entries are home runs. Depending on the competition, you can leave the judging table with an inordinate amount of mediocre BBQ crammed into your belly. Umph. I'm sticking with Chilebrown's assertion. I don't make enough money to spend it on mediocre food. meathenge, We would love to see you come back judging. I like to use a saying of yours; "You can have the best bbq meal ever and come back three hours later and have the worst". I think it went something like that. I do not recall this Soup Nazi treatment at the PH location, though that may be because I often order by the 1/2 lb wherever I go. Beaver Creek was always going to be missed (I used to drive right past Slow Hand to get there), but this is bad news, alas. Very fair write up Chilebrown! The only time I venture into Martinez is if I get a jury summons. I rarely go to bbq restaurants other than Emil Villas in Walnut Creek and only because I grew fond of their flavor profiles growing up. 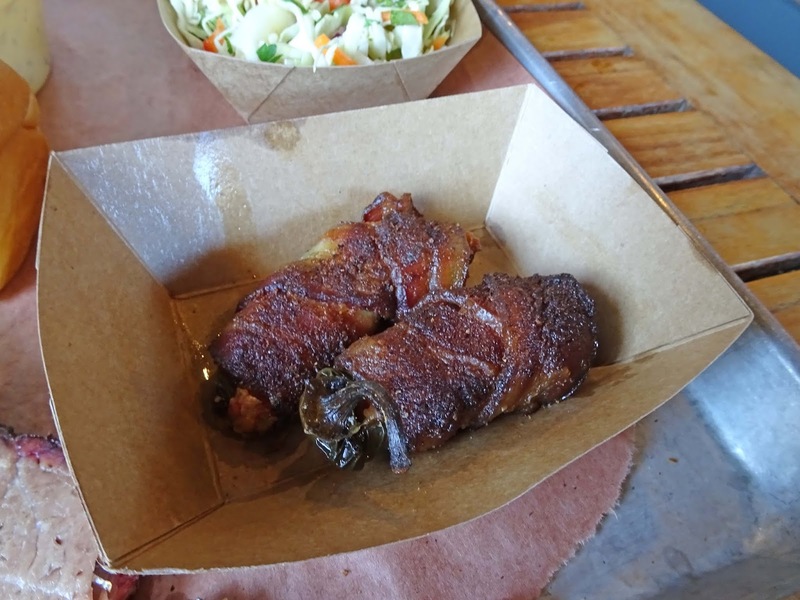 It’s nothing like the vibrant flavors we encounter while judging comp bbq. 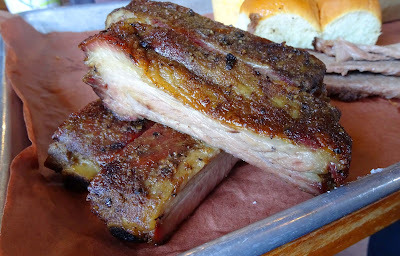 Curious, what are your top 3 bbq restaurants in the Bay Area? Aaron, I was trying to be politically correct by not making the S.N. reference but that is immediately what I though of. Scott Simpson, Interesting question about the top 3. The smart answer is; 'The one I am at. I am going to answer your question sort of because these bbq joints have all ceased or changed hands. Flints, Memphis Minnies and Brent Waltons QN4U have been some of my all time favorites. Thank you for the kind words! I think about Meathenge often. Angles, paths, grasping at inspiration. So far, it has eluded me. I'm sure as hell not giving up though, it'll come. Carry on my good sir!